Hacienda Kass is a visually stunning representation of the traditional Mexican Hacienda-style architecture, the only one of its kind on Soliman Bay. An extraordinary, covered entrance way welcomes you to the exquisite villa, a perfect combination for those looking for style, function, privacy and comfort on the beach. The décor of this tastefully decorated & spacious home, from the formal couches, to the luxurious beds and leather chairs were custom made or hand carved in Mexico. Our extensive original art collection graces the walls of the house throughout. The seventeen foot brick dome ceilings in each room were designed and constructed by fifth generation Mexican masons. The villa is luxuriously equipped to meet your every need; the ultimate combination of privacy and beachfront luxury providing the perfect atmosphere for both vacationing and entertaining. The kitchen is professionally equipped to meet the needs of even the most demanding chef. Upon entering the main living room, enjoy Satellite TV with DVD. The deluxe Surround Sound and IPod system with Bose speakers play throughout the first floor and outside by the pool. Our 120 feet of private beach offers exclusive privacy unique on Soliman Bay. Each of the four master bedroom suites offers breathtaking views of the bay, and the fifth rooftop bedroom opens to a spacious observation area at the highest point in Soliman Bay. The bay itself offers many recreational activities, from snorkeling ventures to the numerous reefs in the bay to kayaking. The beachfront patio is a perfect place to entertain; the spacious infinity pool is surrounded by chaise lounges and an outdoor dining area. The stone Grecian aqueduct spills into the pool, while the surrounding palm trees provide an atmosphere of seclusion and privacy. Our on site staff provides daily maid service. See our rates for weekly specials! 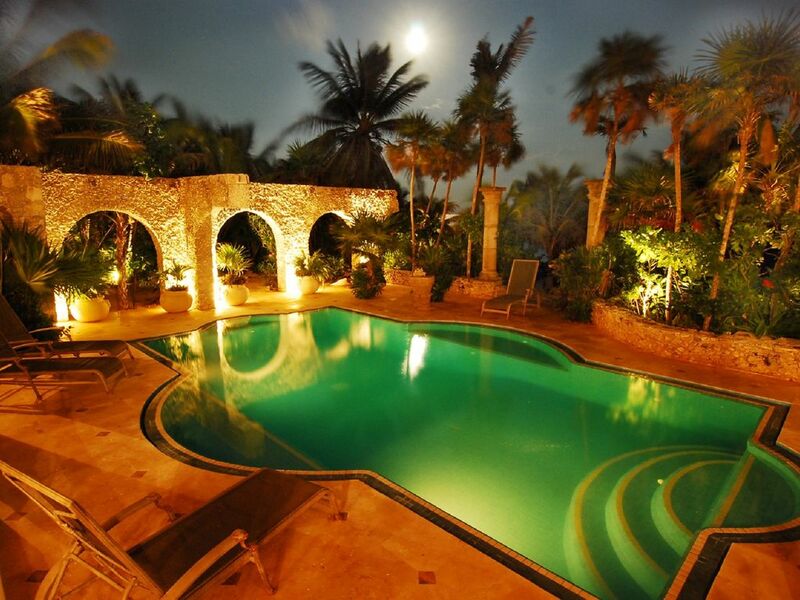 A dream vacation awaits you at Hacienda Kass……. I designed and built this wonderful home! A Personal Chef is available for $1000 for up to ten guests. An additional $100 per week per guest above 10. Guests pay for the cost of all food. An authentic regional Mexican dinner will be available on arrival day and afterward time spent with the chef discussing and planning your meals for the week. Ten steps to the beautiful Caribbean sea! A private Personal Chef Service for 3 meals daily is available to you for $1000 per week for ten people $100 extra per each additional person. Guest pays for all food. Hacienda Kass is a spacious home that sits just steps away from a beautiful beach. It's a touch off the beaten path, but once you've arrived there's not a lot of reasons to leave. I recommend getting the chef service as it's super convenient and very affordable. And the staff at the home was very helpful. The beach was beautiful and the snorkeling was decent as well. Some of the most well maintained sand in all of the bay (as we discovered when we walked along the beach). Stephanie was extremely responsive to all my questions and Monica was helpful when we were actually there. Overall a great place to escape. So happy you enjoyed your vacation. It was a pleasure having you. Everyone always agrees having Chef Carlos makes the vacation a dream! Hope to see you again! I could hardly wait to get home to submit this review and share with others our experience at Hacienda da Kass. Our stay was absolutely perfect! The house was truly stunning and even more impressive than the photos. Kayaking and snorkeling in the Bay were some of our favorite activities and the sparkling pool was so refreshing. It was a perfect fit for our friends and family and for my niece's wedding. We enjoyed dinner poolside on the patio following the rehearsal for the wedding and then surprised the guests with a mariachi band on the rooftop—so fun!!! The following day we had the civil ceremony on the stunning and spacious front porch due to pouring rain, but then the clouds parted and we were able to have a beautiful wedding ceremony on the rooftop as planned with the bonus of an amazing color-filled sunset. Then we celebrated with a beachside dinner under the trees before heading back to the rooftop for champagne and cake. There were so many places to accommodate the different aspects of our small wedding. But beyond the house were the service and the people. Carlos and Antonio were spectacular! Every meal was unbelievably delicious with such a beautiful presentation! And they both did so much beyond just cooking for us. Clemencia and Aaron were precious and so attentive to our every need (even those we had not thought of). We truly felt we were leaving family when we departed. It really was beyond a vacation for us. It was an opportunity to make incredibly special memories that we will forever treasure, and Hacienda Kass will always be part of that. Excellent house for a family vacation. Location and quality hard to beat. Departing today after a week at Hacienda Kaas with extended family (five adults and six kids from ages 9-17). Much better than staying at a resort. House is spacious and well designed. Adults each had own bedrooms and kids used other two rooms. Only problem was two youngest kids on air mattress rather than a bed. Several spaces for us to hangout and catch up with each other. And felt like we didn't even use all the area that is available. Maid arrived a bit too early every day and washer/dryer only available through her by paying for each load. Pay the extra and have the chef prepare the meals. Excellent food and makes trip much more enjoyable. Beach area behind house was perfect size and very close to the house. Extremely well kept even when facing daily onslaught of weeds blowing in. Bay was perfect for snorkeling swimming and exploring. Had to rent paddleboards as not included with house and all the kayaks did not have paddles. Very annoying to only be able to use two kayaks of those available because of lack of paddles. And not all properties keep up their beaches. As a result difficult to go on walks without dodging all the weeds on the beach. Quite bad at south end of bay. Would easily rent this house again and highly recommend to others looking for a carefree place to spend a week with family. And Virginia set up some great tours for us to cenotes and ruins. Spoiler Alert!!! You simply will never want to leave this place! Our week a Hacienda KASS was more incredible than we could of imagined. The architecture is out of this world incredible . Its like being in some true hacienda with art, handmade furniture and incredible design. Even the sheets were like nothing I have ever slept on before! We are real water people so the snorkeling, kayaking and swimming was insane. We saw turtles, rays and beautiful tropical fish. I admit I hired the chef Carlos for the week as a surprise for my wife but it was a win for me. Not only was his food out of this world, but my wife never lifted a finger and Carlos made feeding the kids a dream. Love that guy. Makes a great margarita too.. My wife and I agree we are coming back. And don't miss the roof top. Never seen stars like that ever. Tulum is pretty cool for a night out too. Hacienda KASS absolutely rocks! Bill, we are so pleased that your stay with us met every expectation and excited for your return visit. Carlos the chef, told me to tell you he adored your children and the fact they asked for seconds of his famous Chiles Renejos!! You now quality for our return VIP discount! Our family stayed at the Hacienda Kass in January 2017. This home is undoubtedly one of the nicest homes on Soliman Bay, which is the premier bay near Tulum, Mexico. The grounds are exquisitely manicured by a husband/wife caretaker team and the entire premises give the impression of being in the jungle while at the same time on the beach. There are numerous places outside the house to enjoy the peace and solitude of these beautiful surroundings. That is not the case with many of the other homes in the area. The house itself is huge and well appointed. Each item appears hand selected and custom in accordance with the style of the house. The third floor deck is unusual for most homes in the area. It is great for star gazing and a wonderful location to enjoy a drink and watch the sunset. For a large group or family, Hacienda Kass is extremely well suited for a wonderful getaway. I recommend Hacienda Kass without reservation. Thank you, Ross for your wonderful review. All of us at Hacienda Kass take such pride in our villa and are so very pleased you had such a fabulous experience. Please come back and visit again! Family vacation of a lifetime!!! A picture of our trip now resides in a prominent place on my desk at work and in our home that conjures up day dreams and much needed remembrance during everyday life of the most memorable family vacation of our lives. Our family spans three generations and our past traditional family vacation never had the luxury of having full time daily housekeeping, an incredible chef makeing every meal and drink we could possible want and doing all the shopping! Having all these luuxries afforded us the ability to focus on the quality time, talk and adventures that this villa provided us as a family to enjoy. The house keeper was the kindest person you could ask to be able to relate to your grandchildren. And the chef put all the women at ease about not needing to cook or go out with his fabulous dishes and drinks. My favorite was the fresh grilled fish. The private beach area with the hammocks and the lounge chairs, the kayaks and the third floor balcony and well as the six porches provided the most inviting private space for our family to roam behind a fenced and very private area. This feeling of being in paradise fostered some much anticipated and essential one on one conversations that contributed to the shaping of my family’s future. As a true Hacienda located on huge lot KASS unfolded each day new and exciting individual and family living areas like none I have every experienced on vacation. Privacy and safety were right up there with comfort. We felt free to let the children roam like we did when we were children. So they would come back and report on the new things like turtles and birds that they had never seen with welcomed enthusiasm. The great room area is like the most luxurious hotel lobby one has ever been in with authentic antiques , one of a kind Mayan and Greek museum quality art, sculptures and furnishings that invited authentic interactions. We have family laughter in there like I have never experienced. I was so glad to finally be staying someplace that looked like I was staying is at a large luxurious Hacienda of past years and not another rental with most the of same kinds of furnishing and layout that one can experience up and down this beach in most of the rentals. Thank you so much! We are always so happy to hear that families have had a very special experience at our villa. We are so pleased we could be part of your memories and create a very special place for you and your family. Come visit again! Sat/Sun. Arrivals & Departures during high season. Rates Are for up to 10 Guests. No more than 14 guests . Each additional guest $500 ( 14 guests additional $2,000) A private Personal Chef Service for 3 meals daily is available to you for $1000 per week for ten people $100 extra per each additional person. Guest pays for all food.